I support the position that the NDE is an experiential vehicle not solely for the benefit of the experiencer, but for the dissemination of such universal truths and "perennial wisdom" as may be revealed; that there is quite possibly a "celestial speedup" occurring now which circumvents the long evolutionary process generally required for growth; that it is time to focus on understanding the content of NDEs with the same zeal as has been displayed toward attempting to understand the mechanics. I present revelations from my own NDE, citing relevant commentary from such sources as Gary Zukav, John White, and A Course in Miracles for further amplification. We can bring peace to planet Earth only if we act on the message that hundreds and hundreds of NDEers bring back: it's all about love. This presentation concentrates on analyzing two visionary sensations experienced during near-death experiences (NDEs) and on finding the most suitable explanation to account for these effects: 1) sensations of seeing through ordinarily opaque and presumably solid physical obstructions and 2) sensations of passing through such obstructions. A hyperspatial explanation is favored over two other explanatory models. The first of these other models is the simple out-of-body (OBE) explanation supposing that some aspect of human nature actually separates from the physical body; the second is the brain-generated hallucinatory model supposing that NDEs are entirely brain dependent. The OBE explanation is dismissed because 15 years of parapsychological research have failed to confirm the existence of an OBE component to human nature. The brain-generated hallucinatory model is dismissed because this approach cannot account for the reported paranormal accompaniments to NDEs. In the hyperspatial model, sensations of seeing and passing through physical obstructions presumably become possible when human awareness begins to function within a fractally-dimensioned body possessing more than three but less than four dimensions. Those who occupy this posited body presumably are able to perceive our world from without and to move in fractally dimensioned increments through a spatially more comprehensive reality level existing outside of and at right angles to our three-dimensional world. Recent theories of modern physics predict that the universe has more dimensions than are apparent to us. Many near-death experiencers report the perception that there are more dimensions than we are commonly aware of. These two statements might be related. This presentation examines the possibility of additional dimensions (hyperdimensions), what they would seem like, and whether they seem to be described in out-of-body and NDE accounts. Kansas girl drops dead on sidewalk, travels to Oz, decides to live in Emerald City. She meets others who have traveled the yellow brick road and decides to form a support group. This presentation tells the stories of these travelers' time in the Land of "Awes". Janice Holden, Ed.D. & Jeffrey Long, M.D. My premise is that as radiant NDEs reflect a peak of spiritual experience, so terrifying NDEs are an excursion into the spiritual depths and can lead to profound insight. However, the difficulties in achieving that understanding are enormous. Unlike people emerging from radiant spiritual experiences knowing, "I am loved!," these experiencers know equally strongly that they are threatened, damned, cast out; they carry within themselves not joy but betrayal and terror. During this presentation I share some perspectives about alternative interpretations, based on almost 40 years of personal experience, such NDE-related research as there is, and wide reading in the spiritual literature as well as in Jungian shadow, post-traumatic stress, and psychedelic experience. When a pupil is ready a teacher appears. Numerous teachers have been sent to enlighten me throughout my life. The presentation is not about me: it's about the free gift of the Holy Spirit which is the power of love and self control. The opposing type of power is control of others which I chose to deal with in my family. My multiple experiences gave me insight into people whose hair I styled in Pennsylvania, New York, Ohio, and California. In addition I taught hair coloring, advanced styling, and how to heal the body to produce more hair. For forty years my customers told me of their near death experiences and child abuse. I was born homesick. My first breath was filled with longing to be back in the heavenly realms from which we all come. Nevertheless I found myself here on Earth, squeezed into a tiny little body. I'm still not sure how I, as a wise and wonderful spiritual entity, was convinced I could make a difference here and now. Nevertheless here I am, doing just that! Many of us don't realize we simply suffer from homesickness. It's an epidemic! The good news is it's easy to diagnose and even easier to treat. The prognosis is good and the recovery rate is even better! We can achieve happier, healthier lives as we fulfill our purpose here, and the best is yet to come. Light and LIGHT: an experiencer's exploration of physiological, psychological and spiritual explanations and perspectives. Chuck offers a comparison of experiences of the light, from the clearly physical to the clearly spiritual, building on his own spectrum of "light" experiences. From his search for explanations and meaning, he weaves together a layman's exploration into physiology, neurology, psychology, meditation, spirituality and mysticism. Drawing on many fields, ranging from migraine aura to neurological models of perception, from existential philosophy to Buddhist Adhidharma, from meditational experiences and Wilber's spectrum of consciousness to models of human development, Chuck illustrates both the value of differing perspectives, and the richness of human experience. Are NDErs Out of Their Bodies or Out of Their Minds? Some clinicians have suggested that NDEs are a form of mental illness. One reason for that suggestion is that NDErs often seem to perceive and believe things that non-experiencers cannot perceive and find unbelievable. Another reason is that NDErs often have difficulty returning to the social and occupational roles they had prior to their experiences. Specific mental conditions that have been hypothetically linked to NDEs include autoscopy, drug-induced hallucinations, psychosis, depersonalization, dissociation, absorption, fantasy proneness, and posttraumatic stress disorder. I review the objective data bearing on the question of specific mental illnesses and general psychological distress in NDErs. Based on that review of the empirical evidence, I discuss the possible evolutionary value of NDEs. The majority of near-death experiencers ultimately affirm the inter-connection of us all with each other and with that highest energy source. Most NDErs also confirm that the living, loving, bright, white light is a representation or extension of The Creator, and that The Creator radiates unconditional love and acceptance, forgiveness and nonjudgment. Many NDEs suggest the validity of other higher truths such as reincarnation, and the fact that all knowledge is available to us and most probably is already known on a soul level. Many experiencers report being taken to classrooms and libraries in the other dimensions to learn. Some persons have been shown that although our earthly future is known in the already mapped perfect plan, our free will may certainly amend the direction. Also, although our astral bodies are perfect, our physical bodies are less than perfect, but certainly may be healed during an NDE. Discussion centers on the NDEr's role in society, the influence of spirituality in social settings both informal and formal, at grass roots or political levels, in social activism and in personal growth. Topics included in the presentation: 1) After the Return: What's Next? New directions, focusing new and emerging energies, personality traits, values, goals, shifting priorities and internal chaos in the aftermath of an NDE. Examining values that shape the goals for social evolution, environmental responsibilities and the quandaries of personal "mission". 2) Keys to Recovery. NDErs discovering social, political or environmental goals or activism which in turn bolsters self-actualization and self-esteem. 3) The NDEr: A Powerful Motivational Force in Actions for Good. Spiritual effects on social and environmental issues is explored, including sincerity, religiosity, psychic abilities, energy manipulations, dowsing, healings and visions. Examples from dolphin research and remote viewing. 4) Exploring the perceived or accepted role models and "heroes" in NDE society, and the reasons supporting this. Images defined: Whom do people look up to? Possible audience participation. NDErs reveal a mystery. While having their NDEs, NDErs are everywhere, connected to the entire cosmos, yet they remain as individuals in one place. They transcend time while having their NDEs but are tied to time when they return to life. NDEs are not the only phenomenon that reveals the paradox of man and the cosmos being interconnected, transcending time while also being in place and in time. Eastern philosophy, Christian theology, meditation and quantum physics all support the dual nature of man and his environment. NDEs are one book in the library of life that helps us understand not only our true nature, but the dichotomous nature of the cosmos in which we live. Historically, truth has been seen as a paradox. I propose that NDEs are one of several phenomena that are accelerating spiritual consciousness in the world, rushing us toward Omega. Social psychology research has given us comparative studies of those who have experienced either near-death or UFOs. This presentation investigates subjects who have experienced both. What do encounters with both ND and UFOs reveal about human nature and the nature of reality? From the case files of a transpersonal psychotherapist come preliminary conclusions. The psychology of such experiencers is reviewed as well as how their expanded vision of material, physical reality relates to the new scientific paradigm of subtle energy. This presentation, in panel form, discusses how, and to what degree, marriage between NDEers may differ from a "normal" marriage. At least two sets of NDE married couples describe how they communicate, with particular reference to the use of intuition. Also, how they go about decision-making in their every day lives. Finally, how the NDE experience has affected their common values. In this presentation, I describe the NDE as one of a variety of ecstatic experiences. I then describe other types of ecstatic experiences, discuss what these experiences have in common with NDEs and how they can help broaden and deepen the field of near-death studies. I describe lucid dreams as one of the most easily accessed of ecstatic experiences and also the only experience of ecstasy that has been scientifically proven to be a discrete state of consciousness. I also describe shamanism, and the shamanic journey, as a classic form of ecstasy and how through incorporating shamanism into our understanding of NDEs we can develop a clinical methodology based, not on biological or psychological principles, but on spiritual principles. I was not breathing when I was born. Though I have no memory of an NDE, I have lived the after-effects all of my life. I have always been psychic and had a unique way of viewing life. I felt that I did not fit in - not in my family, nor school nor other situations. This feeling of displacement seems prevalent among infant/child NDErs. Pam Barrett served as an elected Member of the Legislative Assembly of Alberta, representing Edmonton Highlands from 1986 to 1993. Pam quit her job in elected public office the day after she had two brief death experiences. She describes where her soul went on those two occasions as The Hologram, where all souls - past, present and future - dwell in harmonious eternity. In this cosmic stew, every ingredient is discernable but without ego, and all are held in permanent suspension by the gravy: perfect enlightenment itself. Even a hologram which can be thought of as a three-dimensional image formed by light from a coherent source interfering with the object, is insufficient to describe life in death, according to Barrett, because the word fails to address the unlimited number of dimensions of the experience. Her sojourn since experiencing both death and an out-of-body episode has led her to question if even the mind exists as a permanent entity - she explores this in her presentation. "The only boundary between life and death exists purely in the mind," says Barrett. Pam Kircher, M.D. facilitated a discussion among health care professionals about how they see the NDE being addressed in their professional settings. In the past 20 years NDEs have become more widely accepted among the general public, but the medical profession's knowledge of NDEs continues to lag somewhat behind the general public's understanding of NDEs. This discussion was an opportunity to have medical personnel exchange ideas about what has been helpful and what has hindered the acceptance of NDEs in their individual clinical settings. NDErs in the group also shared ways that their health care professionals had influenced their adjustments to their NDEs and ideas about how physicians might be more helpful to NDErs. Finally, clinicians that have been involved in NDEs for years discussed ways that they see the medical profession's attitudes towards NDEs changing. The handout was prepared for Dr. Kircher as a means of sharing her ideas on these topics with the other health care professionals attending the discussion group. There is no recording available of this presentation, but the materials for it are available on-line (opens in a new window). We are all born with a "god spot", an area in our brain that allows us to communicate with a timeless spaceless universe. This area facilitates the near-death experience, is the source of paranormal talents such as telepathy and remote viewing, allows us to perceive angels and ghosts, and is the source of our intuition. Dr. Morse seeks to answer many important questions in the field of near-death studies from a single premise: that most paranormal perceptions take place through the god spot's link to a universal memory bank from which we can access and receive information - and with which we can interact to alter physical reality. Melvin Morse web site (opens in a new window). During the twenty-two plus years I have been researching near-death states, I've been impressed by the degree to which episodes and aftereffects illustrate signs that suggest a transformation of consciousness has and continues to occur in the lives of experiencers. These signs are quite persuasive if you examine the four types of near-death experiences I discovered: initial, unpleasant and/or hellish, pleasant and/or heavenly, and transcendent, along with the subtle psychological profile that seems to go with each, as if predictive of who might have each type. I also consider that no matter how long without vital signs, the vast majority of experiencers revive not only with little or no brain damage but are somehow smarter than before. In shared and group death situations, more than one person can have the same or similar experience. Because numbers are increasing, and worldwide, the transformations associated with near-death states appear to model evolutionary changes in the human family. 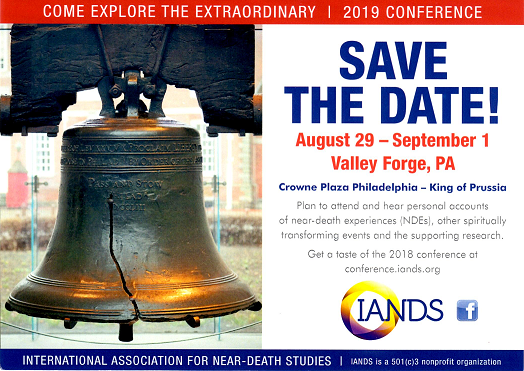 This presentation is about the power of the near-death experience (NDE) to infuse NDErs with the inspiration and passion to make a difference in the world. It is presented especially for those who have had an NDE; however its message holds equally well for anyone who is interested in actualizing more fully their life purpose. Many people share the belief that we are born with a life purpose, or mission, through which we are called to bring forth our talents and passions to serve the world and make it a better place. Given their otherworldly experiences, many NDErs have tasted a universal love and understanding that goes beyond ordinary human experience. Sadly, yet understandably, many of them then find it extremely difficult to be in this seemingly gross physical world. Based on personal experience and years of sweat and tears, the author will share her own insights into the nature of the challenge of being on the earth plane. Ms. McCaffrey has had three NDEs. Her experiences have lead her to create a Non-profit organization, Changing the Face of Death, that is dedicated to public awareness, consciousness raising and service towards the rights of the dying. Ms. McCaffrey has lectured locally on Near-Death Experiences and dying. There is no recording available of this presentation. Jeffrey Long, M.D. & Jody Jovanovich, J.D. A review of near death experiences submitted to the Near-Death Experience Research Foundation (NDERF, www.nderf.org (opens in a new window; 120Kb) web site suggests an important new understanding about our earthly relationships. These new understandings include a relationship concept we refer to as SoulMate, defined for the purpose of this investigation as: "A loving relationship manifesting spiritual growth". A recent survey conducted by Dr. Jeff Long on his Near-Death Experience Research Foundation (NDERF, www.nderf.org (opens in a new window; 120Kb) web site found that out of 100 NDErs, 53.5% answered "Yes" to the question, "Did you have any psychic, paranormal, or other special gifts following the experience that you did not have prior to the experience?" This presentation gives suggestions, anecdotes, etc. from a healer, who is both an NDEr and a professional in the health field. Four researchers discussed their current studies. Dr. Jan Holden, a professor at the University of North Texas, spoke of studies of veridical perception where NDErs are asked to identify a flashing sign in the room where they had their NDEs. The sign was placed in a position that they couldn't see it from the supine position of their bodies. Dr. Jeffrey Long, a radiation oncologist from Tacoma, WA, spoke of his web research site and the information that he is gathering through that site. Dr. Bruce Greyson, a psychiatrist from the University of Virginia, spoke of the window of opportunity that we currently have for studying NDEs in electrophysiologic labs where cardiac patients with severe rythm disturbances of their hearts are frequently caused to have a cardiac arrest in the interest of determining if they need implanted ventricular defibrillators. Willoughby Brittain, a PhD student at the University of Arizona, spoke of her doctoral research which involves monitoring EEGs during sleep in people who have had NDEs and those who have not. She postulates that there may be different brain wave activity in the right temporal lobe beween the two groups. NDEs and other spiritual openings catapult people onto the Mystical Path. Once there, their lives will never again be the same. As spiritual energies speed up during this period of human evolution, it becomes necessary for all experiencers to realize that their spiritual experiences - whether manifested as an NDE or through another form - have been given for a reason. Such experiences provide the opportunity for humanity to realize its true nature. This nature will come about when the ego is transformed into Union with the Divine. To move through this next phase of human development, people must begin the process of confronting their shadows in order to effectively burn away the ego-self. This presentation discusses five stages of the Mystic Path, describes a psycho-spiritual approach that helps experiencers travel this path, and provides information on the challenges involved. Elizabeth Carman & Neil Carman, Ph.D.
Who are we? Where do our souls come from? Why do we journey here? What is the relationship between NDEs and the soul's superphysical life (prior to biological conception)? Are they the same or do they just appear to be the same? Since 1989, the Carmans have been investigating cross-cultural reports (ancient and modern) of the soul's pre-life experience (PLE) in a superphysical world leading up to earthly existence. The Carmans will discuss evidence from contemporary interviewees who report life long memories of the pre-uterine world (no hypnosis) as well as from information collected from philosophy, religion, and indigenous peoples. The element of reluctance/surrender exemplifies one similarity between NDEs and PLEs. Glen, one interviewee, encountered a NDE during surgery. He recalls "Once I floated outside my body, all my earthly possessions meant less to me than a burnt cigarette." Glen finally agreed to return to Earth: "I met my deceased son on the other side and he asked me to take care of the two children his death had left behind. Besides that, I knew I would experience that Peace again someday." Reluctance/surrender plays a similar role in the cosmic flight of the soul to Earth. The Jewish Kabbalah, for instance, teaches that God commands a particular soul: "Descend to a certain place and enter that sperm." The soul pleads: "Master of the Universe, why must I, who am holy and pure and a part of Thy glory, enter an impure sperm? I am pleased with the Paradise I live in. I do not wish to be enslaved and corrupted." God convinces the soul, "You were created to experience human life. You have received certain gifts in order to carry out a role in the Divine plan. The Carmans present parallels between NDE consciousness and PLE consciousness, the NDE life review and the PLE life preview, as well as the ascent up the "tunnel of light" versus the descent. Over a period of nine years, I conducted research interviews with individuals involved in real and ongoing haunting situations. These have been collected into a book of non-fiction stories, The Spirits of Texas, published by Emerald Ink Publishing in March 2001. Over and over, it was my job to ascertain how ghostly communication was received. By relating some of the information I gathered, plus my own encounters with haunting spirits during the procedure, I plan to show that quite often the type of communication is of the exact non-verbal variety experienced during an NDE. Just as survivors of NDEs are no longer afraid of death, I would hope that listeners would lose any fear they might have of "ghosts" and begin to think of them as spirits with a message to relate. This presentation is about the power of the Near-Death Experience (NDE) to facilitate healing and transformation of body, mind and soul. The term "body" denotes the physical body, "mind" denotes mental attitudes, values, core beliefs or worldview, whereas "soul" denotes the subtle or energetic part of the self that underlies mind and body, and possibly acts as a kind of morphogenic field (Rupert Sheldrake) for the mind and body. Extensive information has been presented in the literature about the profound changes in values, priorities and worldviews of NDErs, and also those interested in NDEs. This study focuses on the healing power of the NDE on physical, mental and energetic levels, and explores the mutuality of such healing experiences. The purpose of this study is to explore the internal core shifts experienced at an energetic level, for example Kundalini shifts, and how these might be associated with "external" shifts, such as healing of the mind and body. Information is collated both from the available literature and directly from NDErs. The implications of this exploration are intended for experiencers and non-experiencers alike, and suggest that certain "external" aspects of healing can be facilitated by tending to "internal" conditions. Caring for the transplant patient is more challenging today than at any time in the past. Health care providers must stay abreast of constant changes in technology, immunosuppressive therapy, and new developments in rehabilitation. They also must possess strong interpersonal skills to help them work with different family dynamics and crisis situations. But there is more! Researchers report that one in three patients who encounter a close brush with death will have a near-death experience (NDE). This presentation provides the participant with a foundation of knowledge regarding the NDE which will promote the establishment of a safe environment and encourage disclosure. Definitions of terms such as near-death experience, transplant recipient, and disclosure decisions will broaden the scope of those rendering care to such patients. A review of the literature reflects the most current research in this area. Factors which influence disclosure and nondisclosure are included. The session concludes with suggested interventions for care of transplant recipients who have had an NDE.